May is National Bike Month, and San Luis Obispo offers plenty of beginning, intermediate, and advanced rides for anyone to enjoy! National Bike Month encourages people all over American to see the benefits of bike riding; either on the weekends for recreation, or in day-to-day life, by riding to work or school. There are plenty of events this May to celebrate Bike Month with other enthusiastic SLO residents, which you can learn more about here. 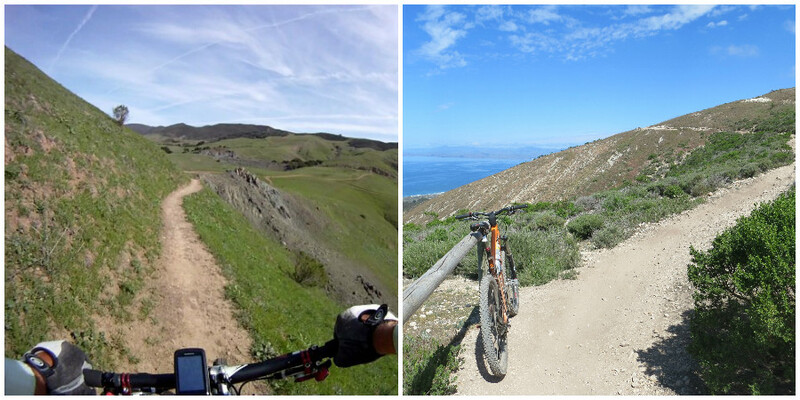 For now, let’s explore some of the trails in San Luis Obispo county that guarantee a fun biking experience that matches your personal level! This City to the Sea Bike Trail is a leisurely, broad-pathed road that transforms the rider from the lush forests of inland Avila to the seas of Avila Beach. To get there, exit on the 101 at Avila Beach and head west. Turn right on Ontario Road, right past the Avila Hot Springs. Go past the KOA campground and you will see a parking lot off to the right. Get going on the trail, which starts right across the street. This trail is fairly easy, so it would be great for the whole family or a group of people biking together. There is also a stop off point where you could grab a bite to eat. It is about a 3 mile ride. This convenient, short path connects the rider from the historic Madonna Inn, adjacent to Laguna Lake Park, to Downtown San Luis Obispo. 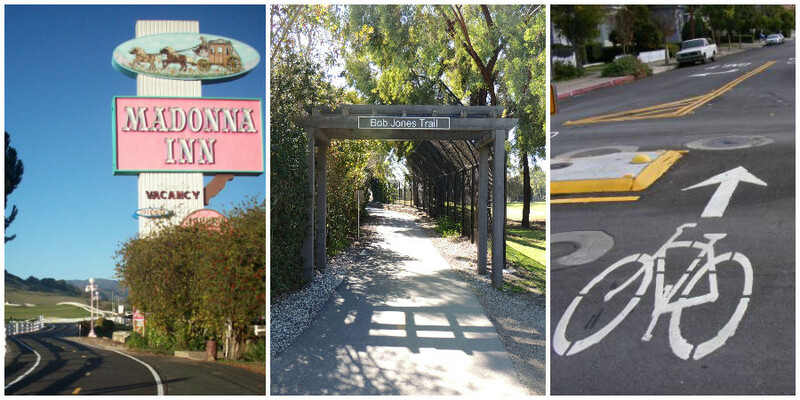 It starts in front of the Madonna Inn, right next to Highway 101, and continues to downtown San Luis Obispo, by Marsh St. This path is perfect for getting around town while avoiding the 101 or other congested areas. It’s about a 3/4 mile long ride. For a unique biking experience, own the road on the SLO Bike Boulevard. The SLO Bike Coalition designed this road so that bikers could have priority, and drivers are re-directed through side streets. It’s located on Morro Street downtown, taking the rider safely to the railroad station. It’s about 3/4 of a mile, and a fun, safe ride through San Luis Obispo’s quaint and beautiful downtown area. You have quite a lot to choose from on the Irish Hills area. Made up of the hills behind the Madonna neighborhood in San Luis Obispo, it provides roughly 10 miles of trails for the public to enjoy. Choose from several intermediate trails, like Froom Creek, which follows an old road up a canyon, finishing off with divine views of the Morros of San Luis Obispo. Froom Creek is about a 3 mile loop. In all of the trails available in the Irish Hills Trails, you’ll enjoy being in nature. This area of San Luis Obispo is fairly isolated, with lush forests as well as panoramic views of the town above. Similar to the Irish Hills Trails, Johnson Ranch offers different paths to take in a secluded, natural and lush area. Johnson Ranch Loop is 3.7 miles, and explores the former ranch land in meandering loops, gaining and loosing elevation along the way. 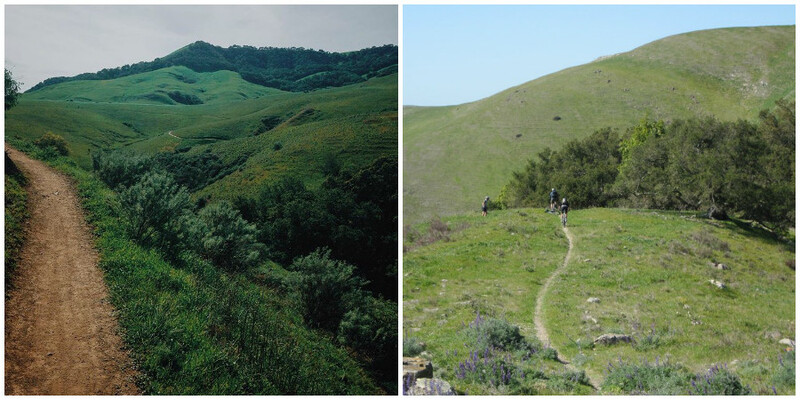 You can also try the 1.5 mile Filipponi Ranch Trail, which connects Irish hills to Johnson Ranch. Either of these trails are appropriate for intermediate riders, and will be a great way to explore the nature in SLO in a relatively relaxed setting. Shooters is a popular trail for locals and tourists alike, but not for the faint of heart. With a steep, difficult ascent and an exhilarating ride back down, it also offers panoramic views of San Luis Obispo and the surrounding area, all the way to the ocean. The trail has sharp turns, shallow water crossings, and occasionally small herd of cattle in the lower areas. It starts from the Cuesta Grade off HIghway 101, and continues through land owned by the City of San Luis Obispo, The Land Conservancy of SLO County, and California Polytechnic State University. Hazard Peak is just one of the many beautiful and adventurous trails located in the stunning coastal Montana de Oro State Park. If you’re looking for unmatched, and unobstructed, views over Morro Bay, Hazard’s Peak is just the trail for you. It runs for a 6-mile round trip over a 1,025 foot climb that is perfect for an experienced biker. The trail starts from Pecho Valley Road, north of Islay Creek Trail and Spooner’s Cove. Learn more about the specifics of the trail here. Visit our website for some more information about biking culture along the Central Coast. Thanks for reading, and happy cycling! Cinco de Mayo on the Central Coast!